Thousands of miles away from her home in the Philippines, an Iloilo-born chef with no formal culinary training has taken it upon herself to promote Filipino cuisine to the world. Globe-trotting Filipino chef Yana Gilbuena furthers her advocacy of spreading the flavors of the Philippines to the world with her SALO Series pop-up dinners, serving delectable Filipino dishes using well-loved Filipino condiments. 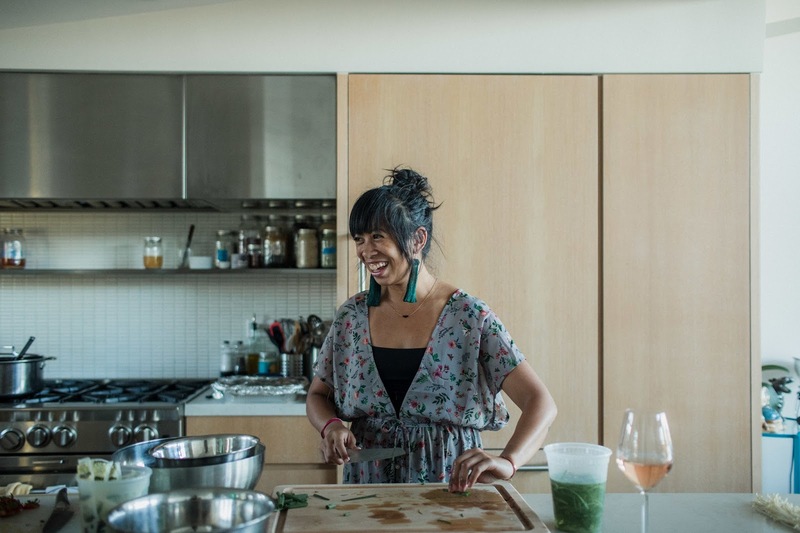 Driven by a desire to spread the flavors of the Philippines, Chef Yana Gilbuena established the SALO Series, kamayan-style dining pop-up dinners that have traveled the 50 states of America. “Kamayan” is Filipino for dining with your bare hands, and Gilbuena’s goal is to serve delectable Filipino dishes to Filipino-Americans, Asians, and practically anyone else who eats. SALO is culled from the Filipino word “salu-salo,” which refers to a banquet where partakers are encouraged to eat with their bare hand's food spread over banana leaves. For Chef Gilbuena, SALO is an “educational, humbling, and communal” experience. Thus, apart from serving well-loved Filipino dishes like adobo (chicken or pork stewed in vinegar, garlic, soy sauce, and peppercorns), pansit (noodle dish), and lumpia (spring rolls), the nomadic Chef Gilbuena promotes regional specialties from Philippine islands as well. Gilbuena acknowledges that there are some Filipino dishes that most Fil-Ams who grew up in the US are not familiar with. In fact, she recalls that they were “pleasantly surprised” by the regional dishes she served them. Gilbuena traces her love for cooking to her early days in the family kitchen, growing up in the cuisine-rich region of the Visayas in the company of her aunt, grandmother, and cooking-inclined yayas (nannies). She recalls her bonding time with her aunt was highlighted by cooking and baking recipes printed on the labels of canned milk. “I became really comfortable with making fire and all those stuff on my own, like dealing with old stoves. I have very fond memories of the kitchen growing up, and I think that’s where it all started. And then the rest, I just learned along the way,” she says. From Anthony Bourdain to Andrew Zimmern, a number of food enthusiasts and critics have been tagging Filipino cuisine as “the next big thing” in the culinary world. But for the globe-trotting Chef Gilbuena, Filipino cuisine’s full potential has yet to be fully discovered and explored as it continues to evolve amid constantly changing influences. The chef likewise thinks that the most defining thing about Filipino cuisine is that it’s constantly evolving. “The more influences we get, the more it expands,” she says. Asked how she would best describe Filipino food to a non-Filipino, Gilbuena calls it the “original fusion,” explaining that the distinct Filipino taste is a balance of not just one or two but many flavors. “I hate the word ‘fusion’ in general because it has had a bad rep, but I use fusion in the sense that we’ve taken all these influences from all our colonizers and made it our own. We even have Filipino spaghetti! I think that’s just the definition of being Filipino, being able to take something from another culture and make it our own… and I love that!” she says. This fusion of flavors that Gilbuena is enamored with is made even tastier and more full-flavored with the well-loved Filipino condiments made by NutriAsia, the Philippines’ top condiments manufacturer. The chef reveals that ever since she started cooking, she has been using Datu Puti vinegar, UFC banana sauce, Silver Swan soy sauce, Jufran sweet chili sauce, and Mang Tomas all-purpose sauce—iconic Filipino brands that bring out the best flavors for Filipino cooking. For Chef Gilbuena, the unique partnership that she has forged with NutriAsia as its Brand Ambassador is instrumental in furthering her advocacy of raising more awareness for Filipino cuisine. “This collaboration makes sense because I use NutriAsia products all the time. I love using Filipino ingredients to make Filipino food. Adobo is the most common one. I’ve tried making adobo using a different kind of soy sauce. It just doesn’t taste the same. “I’ve used red wine vinegar, too, but no—the flavor is just not there. So why not use the flavors of home to make the tastes of home,” she earnestly says, adding that Datu Puti and Mang Tomas are her favorite NutriAsia brands. When curious foodies wonder what Chef Gilbuena’s favorite Filipino dishes are, she readily names “batchoy, which I call the ‘Filipino ramen’, and kinilaw (raw fish marinated in vinegar, ginger, and onions).” For her kinilaw, the chef shares that she uses only her all-time favorite Datu Puti vinegar to “infuse the natural Filipino flavor” to the so-called Filipino version of ceviche. Chef Gilbuena’s SALO Series pop-up dinners continue to thrive touring the world, the details (including recipes and anecdotes) of which are contained in her newly released self-published book, “No Forks Given.” With a constant craving for discovery and experiment and a passion for Filipino cuisine, Chef Gilbuena continues to take on the world, one pop-up diner at a time.